Valpolicella - City Vino, Inc.
Valpolicella is the home to a wine-making region in the Veneto in northeast Italy at the foothills of the Alps. The Valpolicella region is home to several different styles of red wines that are all made from blends of native grapes: Corvina, Corvinone, Rondinella, and Molinara. Unlike other winemaking regions of the world, the different styles are made throughout the region. Valpolicella Classico is the region’s every day wine. It represents the largest quantity of wine produced there. It is a dry, bright, youthful wine that can be served chilled. Valpolicella Superiore is a higher-quality wine, with 12 percent alcohol, which spends one year in oak. The wine is also dry, but is darker in color and more concentrated in flavor than Valpolicella Classico. Amarone della Valpolicella is a powerful wine made from dried grapes. 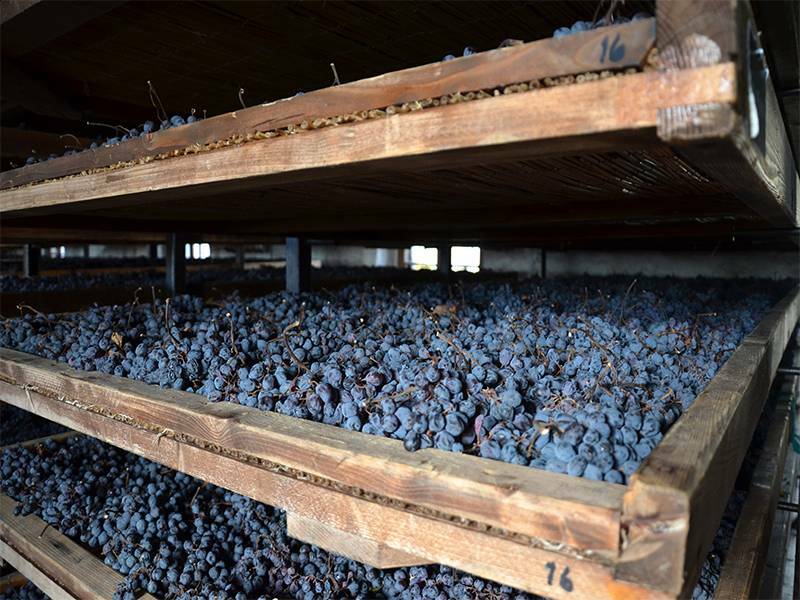 The grapes for Amarone must be placed on mats or strung from the ceiling and allowed dry for four to five months. This drying causes the grapes to lose water which concentrates the sugar. The grapes are then fermented to full dryness, yet the wines give a slight impression of sweetness. The Italian aging rules require a minimum of 2 years before released. Other producers age their wines up to five years. Oak barrels are not airtight and over the extend time oxygen, ever so lightly, enters the barrels. The wine mellows and matures due to this mico-oxidaization. Amarone wines have a minimum of 14 percent alcohol and are full-bodied, and have high acidity with flavors of dried fruit. Valpolicella Superiore Ripasso (Azienda Agricola Crosarola, Valpolicella Ripasso Classico Superiore) is made by taking the pomace (residual grape skins, seeds and other solids leftover from pressing) leftover from the making of Amarone wine and blending it fresh Valpolicella Classico. The resulting wines are medium- to full-bodied, rich yet soft, complex yet enjoyable. Recioto della Valpolicella is a dessert wine made by the same method as the Amarone wine; however, fermentation is halted before all the sugar is fermented, thereby leaving residual sugar in the wine. The wines have about 12 percent alcohol, high acidity, ample tannins, and flavors of rich dried fruit.